Last year right before Passover a woman wrote to me asking me if I had a printable version of the Jewish Food Pinterest Pin. She was hosting her first ever Passover Seder and was hoping to place these Passover-at-a-glance cards to decorate her table. Her idea was to place a card on each guests plate so that they could learn about the Seder by reading. At the time, I rushed to set up the content to be print friendly and in the end I ran out of time. This year, I am happy to offer this Passover-at-a-glance printable for our seder tables. The decorative element on these Passover-at-a-glance cards is a custom illustration of 4 cups of wine. Following that is an overview of the Passover holiday, the meaning behind all the food on the Seder plate followed by the specific order of the Seder ritual. I showed them to my father in February and asked him his opinion. He said “How old are the people reading these?” To him the design-y feel of the smaller print is less important than being able to read the text easily. After talking with him, I made another version (call it easy-reader Passover-at-a-glance) that has bigger font and is two-sided. These Passover-at-a-glance cards are available for immediate download and come in a high quality (300 dpi) PDF file for ease of printing. When you download the file you will receive one A4 sized PDF that contains 4 Passover-at-a-glance cards. 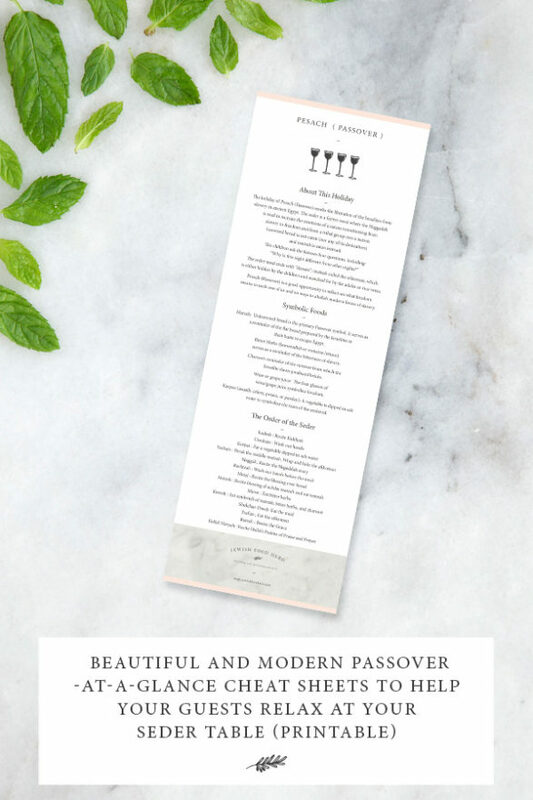 You can print the PDF as many times as you need so that each guest at your seder has one to take home with them. These Passover-at-a-glance cards are simple to make. To our beautiful Passover Seder tables. Your turn: Tell us what you think of these Passover-At-A-Glance Cards! Feedback welcome. A Jewish Food Hero reader send me her photos from a vegan Seder in San Francisco. Look how beautiful her Passover table is with the Passover-at-a-glance Cheat Sheets!